Crunchy almonds coated in buttery toffee make this a must-have this season or any time of year! You only need 5 ingredients to whip up this holiday candy classic in your own kitchen! 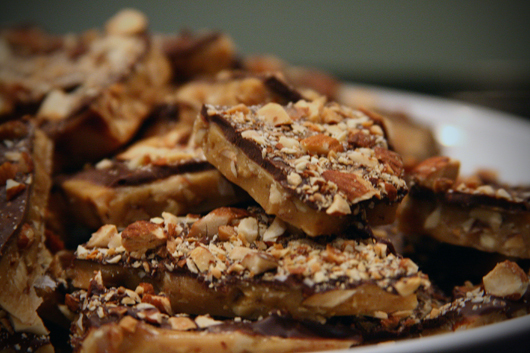 Here is an easy dessert recipe for Homemade Butter Toffee. Preheat oven to 350°. In a shallow baking pan, toast almonds until golden brown, 5-10 minutes, stirring occasionally. Cool. Using a a food processor, pulse chocolate until finely ground (do not over-process); transfer to a bowl. Pulse almonds in food processor until coarsely chopped. Sprinkle 1 cup almonds over bottom of a greased 15x10x1-inch pan. Sprinkle with 1 cup chocolate. In a heavy saucepan, combine butter, sugar and water. Cook over medium heat until a candy thermometer reads 290° (soft-crack stage), stirring occasionally. Immediately pour mixture over almonds and chocolate in pan. Sprinkle with remaining chocolate and almonds. Refrigerate until set. Break into pieces and store in an air-tight jar.